News from the Toley Laboratory for Microfluidic Bioengineering has now been routed to its homepage as a Twitter feed. 1st January 2019: We are happy to welcome two new graduate students that have joined our lab - Priyanka Agarwal (left; PhD program) and Ayushi Chauhan (Right; M.Tech Research program). 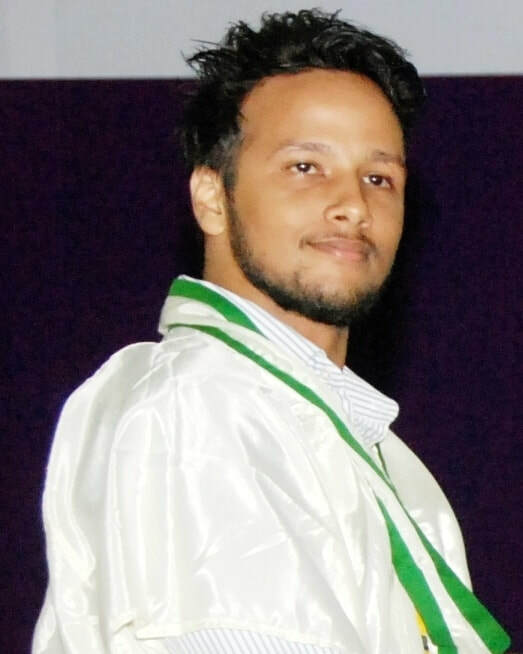 9th October, 2018: We heartily congratulate Dr. Debayan Das, a postdoctoral fellow in our lab, who has been awarded the DST Inspire Faculty Fellowship that will allow him to take up a 5-year faculty position at an Indian institute of his choice. Dr. Debayan will be leaving us soon to lead an independent research group. We wish him all the best in this new endeavour!! 10th September, 2018: We are pleased to welcome Ms Saylee Jangam who joins our group today as a Project Assistant. Saylee obtained her bachelors in Bioengineering with a year in industry from the University of Sheffield, UK. Her undergraduate research was in the area of DNA extraction and sample preparation for point-of-care diagnostics and her thesis was selected as the winning thesis in the engineering category across Europe. Saylee will be working on our project funded by the Gates Foundation focused on developing methods for collection and stabilisation of sputum samples for downstream DNA analysis. 23rd April, 2o18: Our review paper on paper-based nucleic acid amplification tests is now published in Analyst. and is available online here. 2nd April, 2018: We welcome Andrea D'souza, who joined us today as a Junior Research Fellow. Andrea has extensive experience in developing nucleic acid amplification assays. Welcome Andrea!! 20th March, 2018: Our review paper on the use of microfluidics and in-vitro 3D tumor models for cancer stem cell research, published in Biotechnology Advances, is now available online here. As a part of its annual tradition, IISc opened its doors to the general public today to display its cutting edge research and incredible scientific and engineering diversity. Our lab contributed by demonstrating the use of micro paper analytical devices (microPADs) as a means to enable low-cost point-of-care medical diagnostics at this event. Each little stamp-size device shown below can simultaneously detect the presence of three different analytes in a liquid specimen. ​​5th March, 2018: Our group is growing! We're excited to welcome Suraj Kumar Joshi who joined today as a Senior Research Fellow. Suraj is a genetic engineer with extensive experience in nucleic acid assay design. 19th Feb, 2018: Our graduate student, Navjot Kaur, returned from New York today, where she represented IISc at the United Nations Winter Youth Assembly 2018. Here are some snapshots from her trip. ​​8th January, 2018: Dr. Debayan Das joins our lab today as a postdoctoral fellow. Debayan has a PhD in Chemical Engineering from IIT Madras and will work on our Gates Foundation project. We are excited to have him join us! ​1st January, 2018: We welcome Ms. Shruti Soni, who joins our lab as a PhD student today. Shruti has a B.Tech from DCRUST, Murthal and M.Tech from IIT Roorkee, both in Chemical Engineering. ​13th September, 2017: Mr. Ketan Ganar joins the group today as a Junior Research Fellow on our DBT-funded project for developing point-of-care tuberculosis diagnostic technologies. Ketan has a B.Tech and M.Tech in Biotechnology from IIT Guwahati. We are glad to have him join us. 10th July, 2017: We're happy to have Ms. Radhika Narain join the lab as a visitor for a short duration. Radhika has a B.Tech degree from BITS Pilani, Dubai campus, and spent a year as a researcher at the Koch Institute for Integrative Cancer Research, MIT, Cambridge, MA. ​15th May, 2017: Sreepadmanabh M, undergraduate student at IISER Bhopal, joins the lab as an intern. He will be spending two months in the lab. 10th May, 2017: Palas (undergraduate student at IIT Dhanbad) and Sunder (undergraduate student at NIT Surathkal) join the lab as summer interns. They will be spending 6 weeks in the lab. 1st May, 2017: We're delighted to have Dr. Dharitri Rath join the Laboratory of Bioengineering as a Postdoctoral Fellow today. ​Dr. Rath obtained a PhD degree from the Chemical Engineering Department at IIT Kanpur, where she worked on understanding the various transport and reaction phenomena involved in immunoassays. 10th April, 2017: Bhushan has been awarded the Innovative Young Biotechnologist Award (IYBA 2016) from the Department of Biotechnology, India. This is a prestigious career-oriented award for scientists under the age of 35. 5th January, 2017: Mithlesh joins the Laboratory for Bioengineering as an ME student. 30th December, 2016: Sathishkumar and Navjot join the Laboratory for Bioengineering as its first two PhD students. 14th September, 2016: Bhushan joins the Chemical Engineering Department at IISc Bangalore as an Assistant Professor!